On December 10, a poignant candlelight service of reconciliation in Memorial Chapel capped off a turbulent semester in the struggle for a more inclusive, safe, and respectful community on campus. Speakers responded from their hearts to a common prompt — “What is our hope for Colgate, and what will we do to make that happen?” Musical selections provided inspiration while moments of silence allowed time for those gathered — students, faculty, and staff members — to reflect. Although feelings of love and support were palpable, the events of the previous few months, including the sit-in by students in September, were also top of mind. The 100-hour sit-in concluded peacefully with a 21-point action plan authored collaboratively by students and administrators. Throughout the semester, as work progressed on that front, students hosted open discussions of issues of safety and accountability, and staged protests related to the national police-brutality cases in the news. Instances of anonymous threats and hateful speech on social media in relation to the protests spurred vigorous objections across campus and a police investigation. 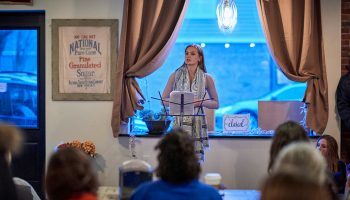 And Professor Kezia Page described the status quo as “a musty, scratchy coat” that she hopes “we never wear again,” and called for more transparency, generosity, and empathy. Drea Finley ’13, ALANA Cultural Center outreach program coordinator; Mark Shiner, university chaplain; Frank Frey, a biology professor and director of the Office of Undergraduate Studies; and Sarah Rende ’15, Student Government Association president, also offered reflections. The event was co-sponsored by the Office of the President and the Office of the Chaplains. 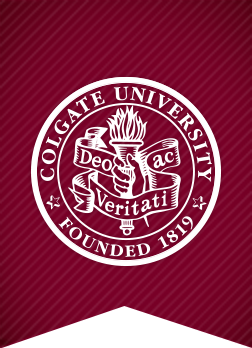 Progress on the 21-point action plan can be found at Colgate For All. Professors helped take some of the yuck out of Yik Yak, the notoriously negative anonymous social media app, when they mobilized a campaign posting positive messages to it just before finals week in December. Sick of hateful posts that cast a shadow over campus, more than 50 professors wrote messages ranging from the silly to the sublime. Most importantly, they did so using their names, in response to the offensive speech that is typically posted anonymously on the site. 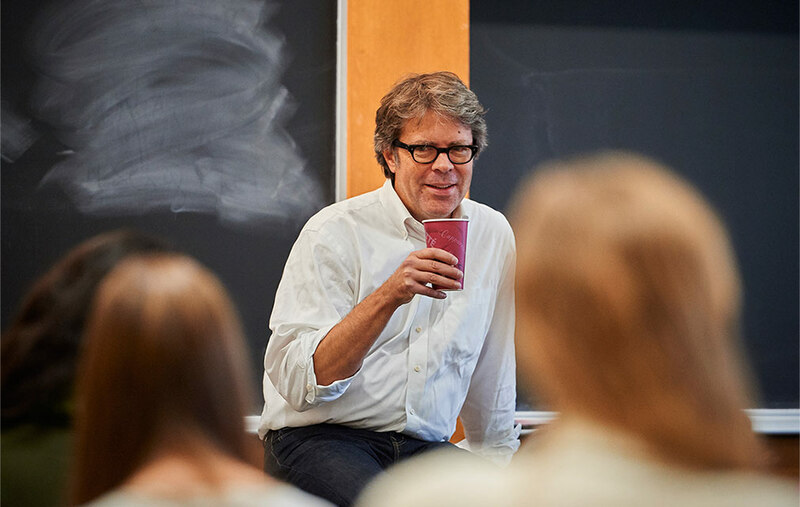 The campaign began when biology professor Geoff Holm noticed a few positive posts from faculty members on the app, but those voices were failing to gain traction. “I thought that if there was a more coordinated effort, it could bring a more positive vibe to the campus,” he said. Holm credited his biology colleague Professor Eddie Watkins with suggesting that the posters identify themselves. The posts included lighthearted advice, thanks, and encouragement as students buckled down for finals. “Sending good vibes and good luck next week — all out in the open. 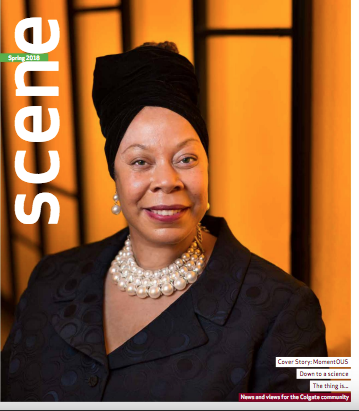 Life’s so much better out in the open,” wrote Kezia Page (English and Africana and Latin American studies). “A good laugh and a long sleep are the best cures for anything,” posted Jenna Reinbold (religion). Technology and science have changed the dynamic of societies. That theme permeated the conversation between Former President and Prime Minister of Israel Shimon Peres and Bob Woodruff ’83, P’13 on October 25. More than 4,000 students, parents, alumni, and others came to Sanford Field House for the 10th Kerschner Family Series Global Leaders at Colgate event. Peres spoke on topics ranging from the development of the Kibbutz movement to the threat posed by ISIS and Hamas, to the fact that, while peaceful cultural revolutions brought about by Facebook and Microsoft have circled the globe, not all citizens have been able to reap the benefit. Barred from this new world by a lack of economic opportunity, young people in the Middle East are taken instead by “the excitement of extremism,” said Peres, swelling the ranks of ISIS and Hamas. 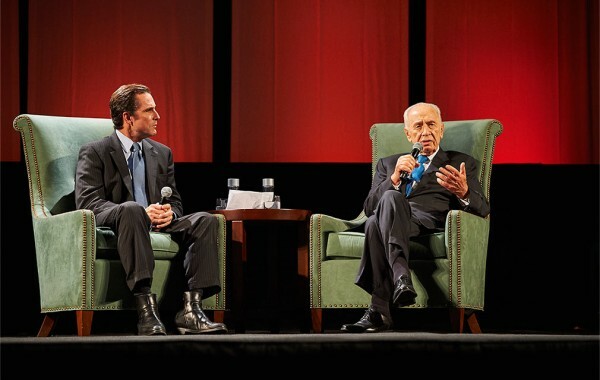 Considering his seven decades in public life, Peres noted that, in his early years, during and even after World War II, there were typically two sides to any conflict. Today, there are 100 sides, and building broad coalitions has trumped unilateral action. And although he supported his country’s use of military force in Gaza, he repeatedly stressed the utility of coalition-backed economic sanctions in response to the nuclear threat in Iran or the tyranny of the Assad regime in Syria. 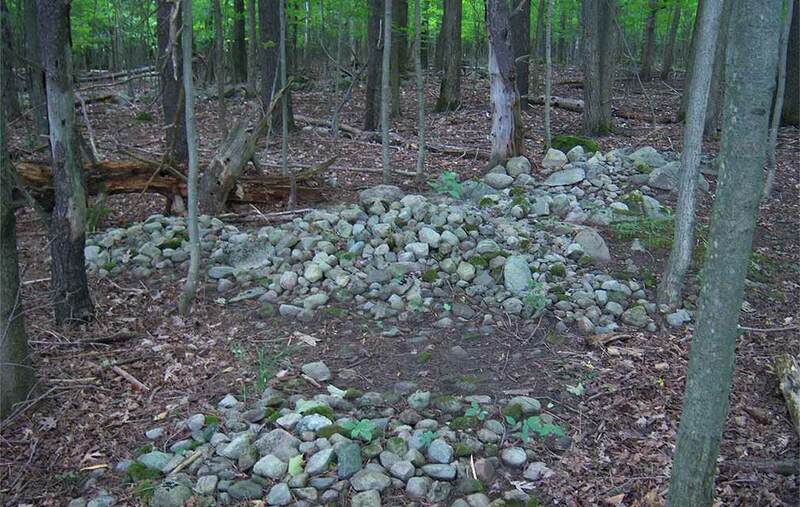 This cairn is just one of many similar features found along a pathway from the Black River to a Haudenosaunee village near Fort Drum, N.Y., that was occupied approximately 500 years ago. Villagers brought the stones up out of the river valley and placed them in these piles, whose meanings are not yet understood. Using the night sky to explain the culture of different societies is a practice familiar to Anthony Aveni. 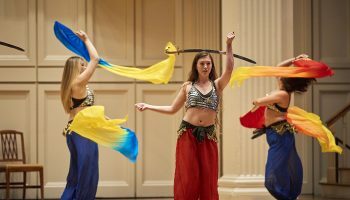 In early December, the distinguished astronomy and anthropology professor co-hosted a symposium intended to spark a dialogue about Native American sacred sites and exploring their connections to cosmic events. Stones and Stars: Ceremonial Stone Landscapes of Northeastern North America, co-organized by Dr. Laurie Rush, cultural resources manager of Fort Drum, N.Y., and held at the Ho Tung Visualization Lab, was the first meeting of its kind. Tribal elders came from Connecticut, Massachusetts, Rhode Island, and Canada. The oral tradition of using the night sky to tell stories allowed them to explain to attendees why their landscapes matter to their cultures. Typically at these sites, stones aligned with constellations and stars in the sky allow them to track seasons, harvest patterns, and sunrise and sunset throughout the calendar year. Joseph Eakin, who runs the visualization lab, introduced the tribal representatives to the revolutionary technology that allowed them to see the sky and its constellations on any day and at any time for their landscapes. He navigated the sky in the dome as they told their stories. Regional officials responsible for site preservation on behalf of the government also discussed the features of ceremonial landscapes, how to identify them in their regional context, and how to effectively preserve these sites in the Northeast. 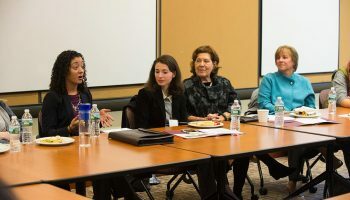 Sponsored by Colgate’s Native American Studies Program, the symposium represented outreach efforts highlighting a strong tie between regional tribes and the university. Turns out, it’s more affordable than you would think to be a locavore (eating locally produced food), at least in Madison County. This observation is based on preliminary research findings by professors Christopher Henke and April Baptiste, Stephanie Chen ’16, and Sarah DeFalco ’15. 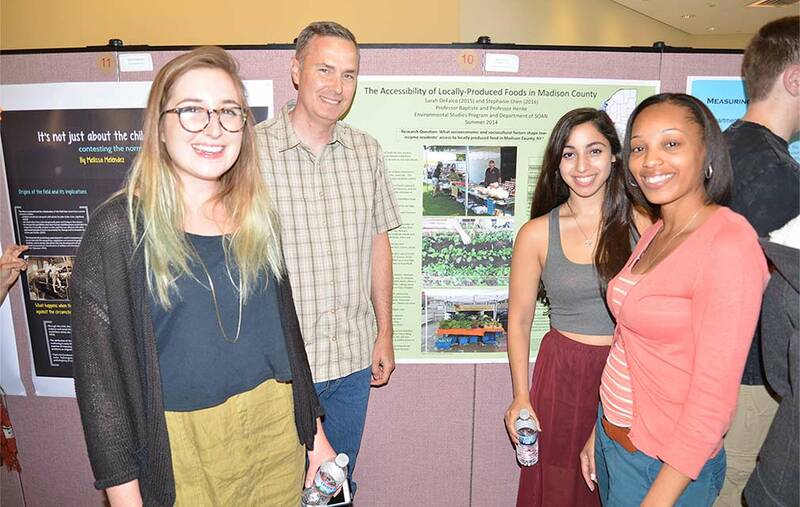 The group uncovered common misperceptions and identified cultural and economic barriers stopping low-income residents from accessing local food options. They gave a presentation at the Hamilton Public Library in November. The team compared the pricing of produce and eggs at several area supermarkets, farmers’ markets, and farm stands. They also conducted 23 interviews with food producers, regional community partners, and Madison County residents. Common responses were that local food would be fresher, but also more expensive. Limitations — some real, some misperceived — included transportation, food preferences, convenience, and inability to use alternate payments like SNAP (food stamp) benefits. “What surprised me most about our findings was that farmers’ market and farm stand produce prices were competitive, and often cheaper, than supermarket prices,” said DeFalco. 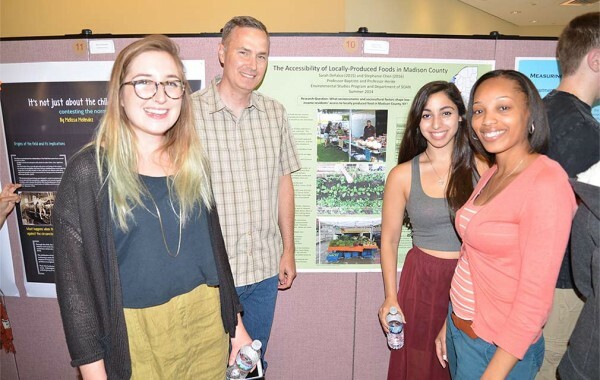 The presentation was attended by residents and Colgate students, as well as community partners including local farmer Jim Wrobel ’79, representatives from the Food Bank of Central New York, Colgate’s Upstate Institute, and community-supported agricultural farm Common Thread. A renovated heating plant that for the first time will use natural gas as a fuel option will significantly reduce the university’s carbon footprint and provide increased flexibility for heating the campus in the years ahead. 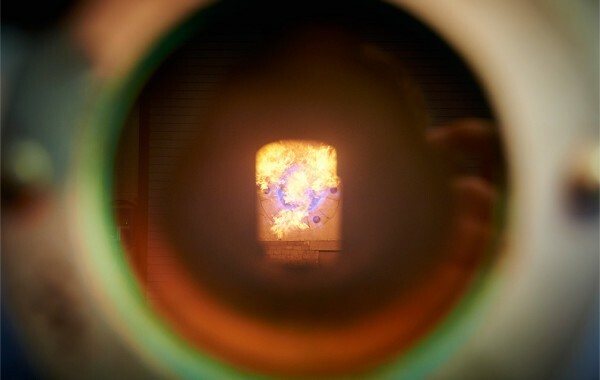 After a series of diagnostic tests, in November, the university deployed two new boilers that replaced three units that burned No. 6 fuel oil, one of the dirtiest types of fossil fuels. This upgrade means far less in carbon emissions and other pollutants being produced at the plant, according to John Pumilio, director of sustainability. “This will reduce the campus carbon footprint by an estimated 1,200 tons a year, open the door for future efficiency and renewable energy projects, and will likely reduce our annual expenditures on energy,” he said. 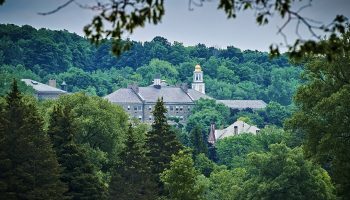 The new boilers came online when temperatures dipped and the main heating system — a wood-fired boiler — needed additional capacity to generate the steam that provides heat and hot water for campus. The wood-fired boiler will continue to be the primary source of energy, processing approximately 20,000 tons of locally and sustainably harvested wood chips per year. It saves Colgate $1.8 million in heating costs each year when compared to a fuel-oil system, and avoids the production of 13,800 tons of emissions. According to Joseph Bello, director of planning, design, and construction, and Dan McCoach, heating plant manager, having the cleaner-burning natural gas option will reduce operational costs and add flexibility to a system that runs 24 hours a day, 365 days a year. The new boilers are part of an $8.4 million expansion and renovation of the heating plant that was approved by the Board of Trustees in January 2013. The introduction of natural gas as a fuel source is the culmination of years of collaborative work with the village of Hamilton, which led the effort through its creation of a nonprofit municipal gas utility. The university, along with Hamilton Central Schools and Community Memorial Hospital, committed to being a customer of the utility, making the project financially viable. “Not only is this an important step in our commitment to be carbon neutral by the year 2019, but this project is of great value to our neighbors throughout the village of Hamilton,” said President Jeffrey Herbst. Hamilton Mayor Margaret Miller echoed that sentiment, calling it a historic day for the community. 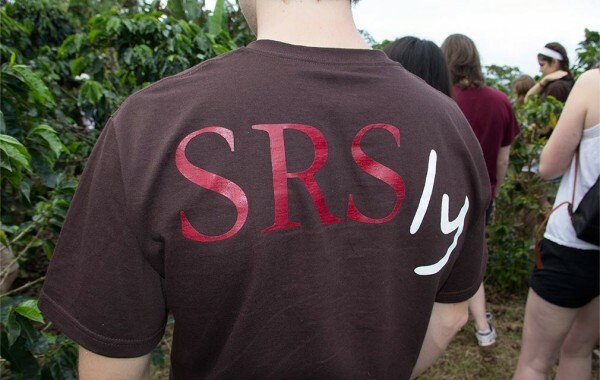 SRSly T-shirts, like the students who wear them, are world travelers. Now in its second year, the Sophomore Residential Seminars program offers students the opportunity to live together and take a seminar in their residence hall. The program includes a trip to a destination applicable to their course of study. Last year, this brown SRSly shirt traveled to Costa Rica for Professor Robert Nemes’s Coffee and Cigarettes course. Each of the five yearlong classes’ T-shirts is an appropriate color, such as black (existentialism) and turquoise (Native Americans in the Southwest). Keeping course-specific colors constant from year to year, “we’re hoping to build a multiyear community,” explained Peter Tschirhart, program director. 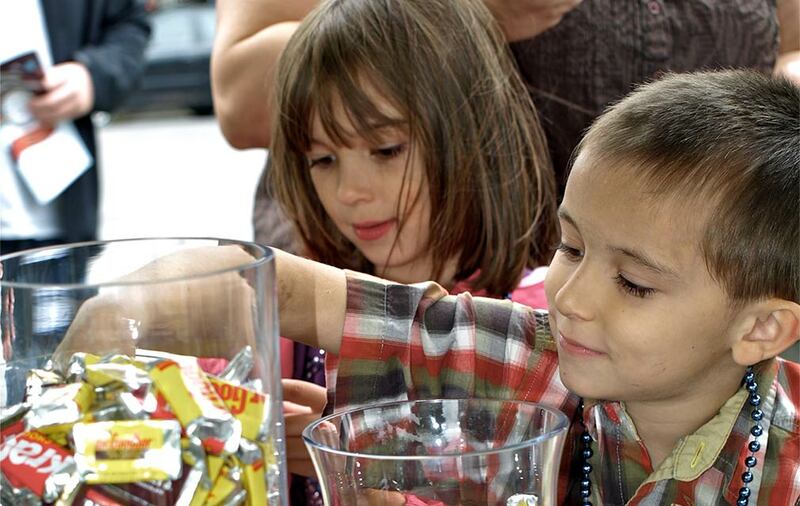 Sweet tooths gathered on the village green on September 20 for chocolate and entertainment by regional artists during the sixth Great Chocolate Festival (pictured). The event marks a moment in Hamilton’s history — “the great chocolate train wreck of 1955” — when an Ontario & Western train carrying a cargo of chocolate bars was diverted from the track, causing it to crash through a coal shed and spill chocolate bars everywhere. This year’s family-friendly celebration included live music, a puppet-making workshop, and a decadent dinner of wine, beer, and chocolate pairings. Community members and students celebrated Halloween in character during a midnight showing of The Rocky Horror Picture Show at the Hamilton Theater. As is tradition, audience members were encouraged to dance along with the movie, add responses or filler lines, and throw miscellaneous things like toast up in the air. Armed with shovels, gardeners and nongardeners alike gathered in October to plant a total of 1,600 daffodil bulbs on the southern village green for The Daffodil Project, which was conceived in 2003 to bring more springtime color to Hamilton. The Wanderers’ Rest Humane Association, a dog and cat shelter in Madison County, hosted the First Annual Pet Paw-ty on November 2 at the Colgate Bookstore. Paw-ty goers had the opportunity to adopt foster and shelter cats and dogs, play with therapy dogs, learn about the importance of acting in a humane way, create animal-themed crafts, and listen to a reading of Rover. There was also a book signing by local author Hank Leo Jr., whose book In Your Hands is a story of life lessons told by a Siberian Husky named Louie.